A3 Size 10.5 x 14.6 in. (267 x 372 mm) 11.7 x 16.5 in. 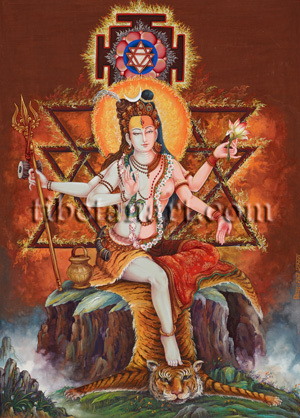 Ardhanarishvara, meaning the ‘Lord who is half woman’, is a composite and androgynous image of Shiva-Shakti, or Shiva and his consort Parvati or Umadevi, united together in one bodily form. As in the iconography of virtually all Hindu and Buddhist deities-in-union depictions the male occupies the right side and the female the left side. Thus the right half depicts white Shiva and the left half pink Parvati, with a mid-body line that both divides and unites them. Shiva’s forehead is adorned with sandalwood paste and his three eyes are bow-shaped, while Parvati’s forehead is adorned with vermilion powder and her three ‘lotus-like’ eyes are oval. Shiva wears a crown of skulls with a white crescent moon above. Half of his tawny matted hair is bound up in a topknot, while the other half hangs freely behind his back. From the centre of his topknot cascades the white torrent of the River Ganges, which he compassionately breaks in its powerful heavenly descent to earth. He wears bracelets, armlets, and necklaces of rudraksha seeds, a garland of skulls, and the cobra-like serpent Vasuki coils around his neck. His loincloth is a tiger-skin adorned with a belt of golden bells, from which hangs his horn. With his first right hand he holds a small pearl-like lingam, and with his second hand he holds his traditional attributes of a trident and damaru, while his water pot rests at his side. Parvati wears a golden tiara of precious gemstones, and half of her blue-black hair is bound up in a floral topknot, with the other half flowing freely down her back. She wears golden bracelets, with gold and jasmine flower armlets. Her golden neck-choker, coral and pearl necklace, and gold-coin necklace unite with Shiva’s rudraksha bead necklaces, while her white flower garland unites with Shiva’s skull-garland. She wears a red silk apron and skirt, and her palms are adorned with henna designs. With her first left hand she makes the abhaya-mudra of dispelling fear, and with her second left hand she holds aloft a pink lotus. Ardhanarishvara sits upon a rock and tiger-skin in a posture of royal-ease with Shiva’s foot resting on the tiger’s head, while Parvati’s leg is drawn up. A fiery halo adorns their unified crown with a large, fiery yantra of Shiva-Shakti behind, consisting of two downward-pointing female triangles that interlock with one upward-pointing male triangle. The same white and red shiva-shakti yantra appears above within a pink lotus-circle of eight-petals, with a fiery square bhupura or ‘earth-city’ with four directional gateways surrounding it.